No Minimum Quantity: 1 @ $9.00/ea. See related product A11 below! 2019 or 2020 Almanac Calendar and Old Farmer's Almanac Book BUY THEM TOGETHER!!! have been manufactured for over 130 years and contain over 4900 bits of information including daily Fishing guides, Planting gardens by the signs, Sun rise and sun set times, and Weather. Breeding charts, Conversion tables, first aid, helpful hints are included on the extra 4 pages. 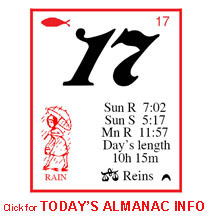 The Old Farmer's Almanac Book: Special Gift Edition with 64 pages full of valuable information! It contains weather predictions for 16 different regions of the US. With even more Planting and gardening guides. Best fishing days and times! Important dates, feast, aspects, best days and much more!!!! 2018 version. If you order less than 10, the calendars will come rolled and wrapped. If ordering 10 or more, they will be packaged flat with cardboard. ORDER NOW! WE HAVE THEM IN STOCK!